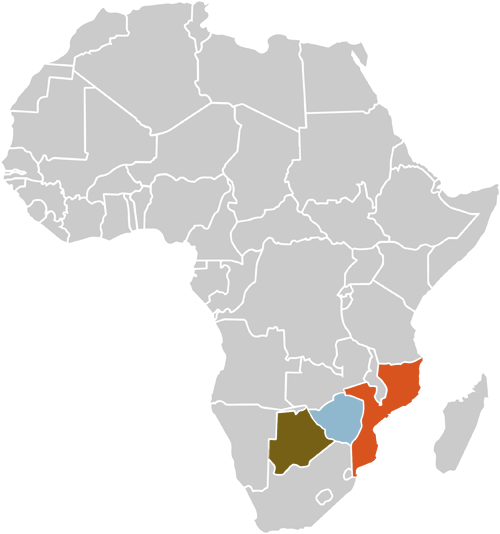 In 11 days, see sunny South Africa, Swaziland and Mozambique. Cape Town, the Blyde River Canyon, Kruger National Park, marvel at the Big 5. The rainbow nation has 3000km of coast, geological wonders and vibrant tapestry of peoples. Ponto do Ouro in magical Mozambique, with its pristine white sandy palm fringed beaches, swim with the dolphins in tropical waters, deep sea fishing and romantic sunsets. The Kingdom of Swaziland with its friendly people, the mountainous kingdom of a thousand smiles. Today, we will visit Table mountain (cable car), the Company Gardens, Castle of the Cape, South African Museum, Bo Kaap, District 6 and Greenmarket Square. Before noon, we take the opportunity to visit the noon gun in action on the slopes of Signal hill, the worlds oldest canon, still in action. After lunch, we visit the only botanical garden situated in a world heritage site, this garden has more endemic plant species than any other in the world. Lunch In the late afternoon we go to Blouberg across the bay from Cape Town where you enjoy a “postcard” view of Cape Town, Table Mountain, Robben Island and Table Bay. NB: Optional excursions. Like tandem paragliding, shark cage diving and sky diving are weather depend. This region is a UNESCO World Heritage site for its exceptional floral diversity. We follow the west coast via Clifton with a stop at Maiden’s Cove to enjoy a magnificent view of the mountain range known as the Twelve Apostles and Camps Bay then to Hout Bay, a charming little town where we embark for a boat cruise to Duiker Island, home to the worlds largest fur seal colony. The scenic Chapman’s Peak Pass offers breathtaking scenery and photo opportunity’s Cape of Good Hope is where the cold Atlantic waters meet the warm waters of the Indian Ocean. This famous landmark was named by the early Portuguese mariners. Journeying down to the False Bay coast, lunch is at the old harbor of the historical naval port of Simon’s Town. After lunch we visit the well known Boulders beach, home to Africa’s largest land based jackass penguin colony. We finish our day with a visit to Groot Constantia, South Africa’s oldest Cape Dutch manor house and wine farm built by the first Governor of the Cape. We drive to Stellenbosch, where lions and elephants once co existed with SA’s original inhabitants the Khoisan. Today, Stellenbosch is known for its beautiful varied architecture, renowned wines and famous university. We explore this famous town (2nd oldest in SA) on foot, stopping at a micro brewery where we enjoy lunch. We travel over the beautiful Hels Hoogte on our way to Franschoek. Stopping for a wine tasting and cellar tour. A visit to the Huguenot Museum. At an exceptional boutique wine farm we taste local vintage including a Pinotage which is South Africa’s own unique cultivar. At Paarl we stop in front of Mandela’s statue at the entrance to the prison from which he was released in 1990. Paarl means “Pearl”, in Dutch, and refers to the imposing granite mountains surrounding the town. The Taal monument, dedicated to the Afrikaans language, is the world’s only monument to a language. A highlight on this tour is a visit to the cheetah outreach program, entrance fee included. We depart for the beautiful Blyde River Canyon in Mpumalanga. Stopping for lunch in Dullstroom, the trout fishing capital of South Africa. We follow the scenic Panorama Route and admire God’s Window, the Glass elevator at the Pinnacle (optional) Three Rondavels, Blyde River Canyon, Bourkes Luck Potholes and the Canyon waterfalls. Pilgrim’s Rest is an historical village dating back to the 1880’s. Founded during South Africa’s first gold rush and is now a National Monument. Time permitting, a swim in the beautiful MacMac pools to cool off. Accommodation is near the edge of the canyon. We arrive at the famous Kruger National Park before lunch and begin our safari into this bushveld wonderland. Enjoy a light lunch on the banks of the mighty Sabie River. A glorious sunset safari has been reserved for you. The professional game ranger will enthrall you with stories of the African bush and point out the Big 5 and other rare and endangered species. Around 4.30 am we leave camp for a 3 hr morning 4×4 safari with a professional ranger to witness the African Savannah and wildlife in all its splendor. Return to camp for a hearty breakfast followed by a full day safari with your guide. An optional night drive can be booked at the reception on arrival. Accommodation in National Park chalets. NB: If accommodation is outside the Kruger Park a Full day 4×4 safari with a professional ranger will replace the 2 x 3 hour game drives. This morning we depart the Kruger Park on our way to Mozambique. Stopping for breakfast in Komatipoort before crossing the border. Visas issued at the border post. Portuguese is the official language although English is understood. He head South for Ponto Do Oura where we will arrive for Lunch. After checking in, you have an incredible variety of activities to choose from for the next 3 days. Snorkeling, Surfing, Scuba diving, fishing, Hiking, Swimming with Dolphins, Deep sea fishing, various Cultural activities, the Maputo Elephant Reserve. Activities on offer are Snorkeling, Surfing, Scuba diving, fishing, Hiking, Swimming with Dolphins, Deep sea fishing, various Cultural activities, the Maputo Elephant Reserve. We will arrange preferential rates for any activities you request. As your activities take place under the African sun please do not forget sunblock, light clothing and drink plenty of water. After a day of water sport activities or if you have relaxed on the beach, enjoy a wonderful seafood bar Bar B Que on the beach. With the sounds of the Indian ocean and a guitarist singing Portuguese folk songs creating magic in the African tropics. Today you will depart for the Kingdom of Swaziland. The road trip from Ponto do Ouro to the Hlane Royal Game Reserve in Swaziland is four hours. The reserve is home to Lion and the very endangered White Rhino plus numerous Antelope, Zebra and Elephant. (Due to rapidly decreasing numbers of White Rhino by poachers. You are earnestly requested not to post any pictures of these wonderful prehistoric animals on Social Media). You will be accommodated in traditional Rondawels with all mod cons. Sit behind unobtrusive fencing and watch the amazing animals of Africa drink from the dam next to your camp. An African style Bar B Que around the Boma ends your day under the magical African night sky in Swaziland (own account). This morning after breakfast we leave for Johannesburg continuing through Swaziland on the way we drive to the beautiful Ezulwini Valley with a visit to the Swaziland craft and candle factory. Near Mbabane, capital of Swaziland, we will admire the Royal Palace, Parliament, and the Kings Mausoleum all from our vehicle. We will later depart Swaziland through the beautiful Southern Mpumalanga. We view the oldest and best preserved volcanic and sedimentary rocks in the world. Known as the Genesis of Life, the Makhonjwa Mountains are a UNESCO World Heritage Site. After a light lunch on route (own account) we depart for O R Tambo International Airport for your onward flight home.